And then out of nowhere I won a Best of Austin 2010 Critic’s Choice poll for "Most Amazing Use of the Human Foot". Someone from the Austin Chronicle must have come in for a massage. You can imagine my surprise! I would have had no idea I had won were it not for a friend who texted me congratulations. That award helped put Austin Ashiatsu on the map! Now here we are 8 1/2 years later and Austin Ashiatsu has grown into a company of nine wonderful women! I feel honored to work with this amazing team and I couldn't be more proud of each one of these ladies. I strongly believe being recognized as a Best of Austin 2018 Critic’s Pick for “Best Couples Massage” truly reflects our team effort. 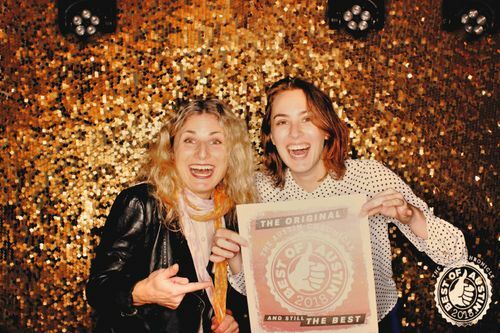 Our Director of Therapists, Mandy Wolfson, and our Office Manager, Mary Streepy, will represent Austin Ashiatsu at the Austin Chronicle Best of Austin 2018 Party. These two have been working hard behind the scenes over the past three years to help make Austin Ashiatsu what it is today. And what better way to celebrate a win than to dance it up at the celebration party! We’ll make sure they bring back good photos! As a recognition to you, *|FNAME|*, for supporting our business, we would like to offer an extra $10 off each massage in a couples session for the remainder of the month of November. This discount also applies to couples session gift certificates bought in November (these make great stocking stuffers guys). So if you have never experienced our award winning couples massage, now is a fine time to check it out with the one you love! We are so grateful for you. I hope you can feel it every time you walk up those stairs. Whether it’s been a week or even a year since your last visit, we honor you as part of our community and would be delighted to see you again soon. Cathy and The Amazing Austin Ashiatsu team! !